This is one of two smoothies from the blender of Joanie Utah, my milk tooth twin! Joanie makes YOGURT CUBES by freezing yogurt in ice cube trays. But I just use Greek yogurt from the fridge because I'm not sure where my ice cube trays are, and also I use almond milk instead of soy just because. 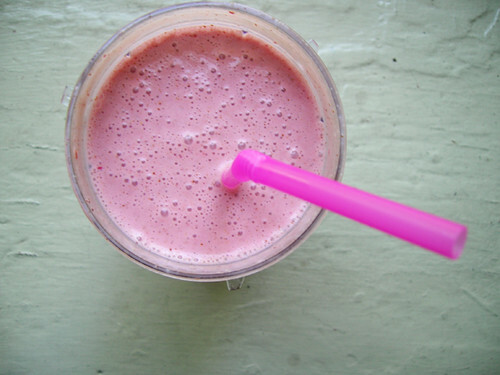 Put the strawberries, yogurt, and almond butter in the blender cup and pour in a good amount of almond milk. Screw on the cap, stick the cup on the motor base, and blend for 30 seconds. Then take it off the base and give it a little shake to get anything that's stuck on the top of the cup. Blend for another 20 seconds or until the smoothie is churning freely from top to bottom.